Third International Conference on Digital Society (ICDS 2009), Cancun, Mexico, February 1-6, 2009. The University of the Digital Society is based on interactions that facilitate learning in a new pragmatic context. Catalysts involved in the learning process replace the traditional professor. Students dynamically constitute classes of shared interest, which cease to exist once learning goals are achieved or prove unattainable. Learning, procedural in nature, takes place in the interaction, eventually embodied in a project. The digital infrastructure of the widely distributed, new virtual learning environment must be specified in terms of educational goals. Extremely rich data and many different computations will have to be seamlessly integrated. Modeling and access to data, corresponding to intuitive forms of interaction, will exceed all other forms of computation—a major challenge to everyone involved in conceiving methods appropriate to the new education. Learning driven by anticipation—proactive acquisition and dissemination of knowledge instead of training in reaction to the problems we face—is the basis of the new education. The past is becoming irrelevant. In the fundamentally pragmatic context of the emerging digital society, most of the knowledge accumulated to date remains of cultural relevance at best. The traditional model of education involves the following: 1) acquisition of knowledge from experience, and validation; 2) storage of knowledge; and 3) dissemination. It corresponds to a world of permanence, stability, and limited dynamics. Definitory of the new context of life and work is transitoriness (nothing is permanent anymore), instability, and an ever-broader dynamics without any repetitive patterns. The experience is one of discovery; the method is heuristic. Not only the technology changed, but also the means through which knowledge was accumulated and shared, in particular the role of language. (For a more detailed presentation, consult The Civilization of Illiteracy [1, pp. 729-767].) Once upon a time, the university, like the church, shaped those who joined it, either as students or as educators. Today, what shapes the human being are unprecedented experiences of discovery that take place at the forefront of new forms of thinking, understanding, and creating in a variety of media, and in situations that no longer extend experiences, but trigger new situations. In addressing the impact of networking, nanotechnology, robotics, new market dynamics, and risk management within a scale never before imagined, to react is useless. The anticipatory perspective is required. This means modeling the future as a space of possibilities and integrating control mechanisms guided by selections within this space. In the education of the past, the understanding of protein folding, or social networking, or risk management was based on knowledge accumulated in articles, books, libraries, archives, etc. In the new education, protein folding is an interactive game— FoldIt (University of Washington)—deployed on the Web. The performance of millions of participants (gamers) is integrated in a new understanding of the protein folding process. The aggregation of the knowledge in game format—for instance, massively multiplayer online role-paying games —is different from any form of knowledge aggregation we have ever experienced. Social networking is proactively learned as we deploy many models (e.g., Facebook, Linked In, YouTube). Risk management is evolving as the practice of risk mitigation (cf. Nadin ). Within its centralized, sequential, deterministic mode of operation, the university of the past cannot handle any of the problems mentioned above. And the future will not hold lesser challenges. The question is not “How important are universities in today’s world?” but rather, “Are they sustainable in their current form?” Many universities in the USA depend on students from abroad to an extent difficult to imagine. Research gains in significance, but within a context of shorter cycles of innovation and fewer available quality researchers. So does the need to engage young and old in education as a form of discovery, not as a celebration of past accomplishments. Public and private resources, even in extremely prosperous communities, are less and less available for wholesale imparting of marginally relevant information. We are facing a change in the flow of information to the extent that creativity appears to be related to uninhibited creative procedures that result within the dynamic interaction focused on shared interests. The time of the singlediscipline department is transcended in the centrifugal model of borderline disciplines . Sustainability is as interdisciplinary as interdisci-plinarity gets; likewise for the new medicine. Neither the idyllic campuses of famous universities, nor the mega-campuses of medical schools, nor the bioengineering “factories” mushrooming on some campuses accommodate the understanding of an information-driven discovery and validation process. They are at best opportunistic statements—fishing for grant money, until priorities change again, and for students, especially those who are funded. Instead of building the university of the future, they try to consolidate, and sometimes to rescue, the past. Peter Drucker put it radically: “Thirty years from now, the big university campuses will be relics. Universities won’t survive. It is as large a change as when we first got the printed book,” . The new model of education involves: 1) generation of knowledge through discovery; 2) validation of the knowledge accumulated in the process leading to discovery; 3) sharing heuristic methods. The emphasis is no longer on object, but on process. Transitoriness, instability, and the broader dynamics are subsumed in the learning experience. The ENIAC, one of the earliest computers, weighed 30 tons and occupied an entire building. To compare it to early or late universities makes no sense. Nobody would apply the soon to be obsolete Moore’s Law—doubling of processing performance and reduction of chip size every 18 months—to the university. But the contradistinction of the two is at least suggestive. No computation today carries with it the experience embodied in the ENIAC. Today’s knowledge acquisition, expression, and communication are already fundamentally different from the time when universities came into existence. Accumulation of data is supplanted by the focus on navigation, retrieval, and data-mining. The dynamics of top-down educational experiences is replaced by a mix of peer-to-peer and bottom-up (aggregated knowledge) action and interaction. The economy within which the new university comes into being is by and large grounded in information processing and ubiquitous computing. The e-economy alone, still experiencing very fast-paced growth (over 150% last year) is approaching the threshold of 50% of the total economy. Evidently, it penetrated the old university. On Second Life alone, there are already many new universities. Though not fully accredited, they make possible learning experiences, such as interface design for the handicapped, architecture of virtual space and time, cultural identity, and remote health care, for example. Instead of submitting to the rules of limited resource sharing (who can use the only telescope and when? ), the Web-based mindshare makes possible remote access to state-of-the-art facilities. Competition is not eliminated, but takes place against the background of a realization of sustainability. This realization transcends the opportunities and limitation of the brick-and-mortar institutions: Should we heat the buildings during break time? Should we air condition them during the summer? Is enrollment a matter of season when continuing education becomes more important than acquiring a college degree? But in this paper, I do not want to limit myself to spelling out general principles. Rather, I want to focus on the specifics of an anticipation-driven model. 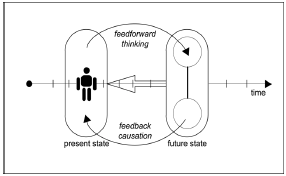 An anticipatory system is a system whose current state depends not only on past states, but also on possible future states. 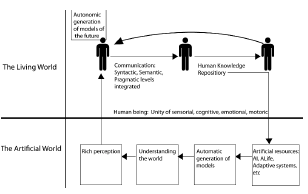 The possible future states of significance to learning correspond to new circumstances of human existence: scarcity of natural resources, global warming, global economy, networked world, among others. 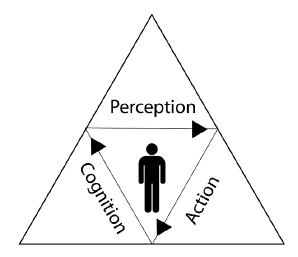 The model of anticipation I submit is informed by cognitive studies and brain research; more precisely: In all our actions, there is a reactive and an anticipatory component. Sometimes the reaction can preclude anticipation. For instance, under the political pressure of a hot electoral campaign, the meltdown of the financial market brought about by the sub-prime mortgage debacle was met by a cascade of reactions (avoid the bankruptcy of Bear Stearns, AIG—that is, maintain the old institutions). This knee-jerk reaction eliminated the anticipation of the risks involved in the opportunistic measures that the government initiated. Other times, it is difficult to deconfound reaction from anticipation. Think about some fast basketball sequences in which a good defense (reaction) is actually the prerequisite of anticipation—attack on a less than free flank only in order to enhance the chances of scoring from a player minimally guarded. And, finally, in some cases, reaction is made useless by effective anticipation—in aquaplaning, do not react! This applies as well to the meltdown of the stock exchange. An education driven by anticipation does not eliminate reactive components. Rather, it integrates the two. 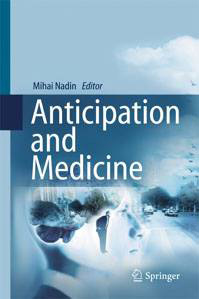 In any case, anticipation is always expressed as a selection: from many possible futures, we choose, consciously or in an autonomic process, what makes sense in a given context. But after all, in order to give substance to these thoughts, we need to focus on the subject of every educational process, that is, the individual, young, or mature, or aging men and women in their cultural, religious, economic, political diversity. The human being is the unity of the sensorial, motoric, and cognitive. It does not only receive information from outside, but also generates information that guides its own functioning and interaction with others. To understand the integrated nature of the individual, moreover, to understand that the integration is variable, is a prerequisite of any attempt to design educational processes. Indeed, the university driven by anticipation is one of processes, not of states (cf. Nadin ). At the University of Durham, England, Active Learning in Computing, an attempt at so-called Technology Enhanced Learning focuses on the Smart Desk—an interactive multi-touch screen. It is meant to enhance student engagement through learning by sharing . Interactive Knowledge Visualization is at the core of this approach. Roshan D’Souza (Michigan Technological University ) is working on agentbased modeling. This allows testing in the virtual realm, replacing dead-end experiments. Agent-based modeling simulates behaviors of complex systems (pandemics, stock market futures, ecosystem dynamics, among other areas). One can imagine learning focused on human response to injury and infection. As opposed to the various models of education that integrate more and more computers in the educational process, we start with the notion that the informational foundation of learning is ubiquitous. We no longer identify computers (neither large servers nor mobile devices, or implants, or even large touch screens), but rather information processing. The individual is yet another node in the network, capable of reconfiguring the network. To predict that wearable components, or implants, or micro-devices making up the surroundings (smart dust, for instance) will eventually replace today’s computation is at best silly. Nanotechnology might surprise us again, or some other forms of matter integrated in information processing might prove even more adequate to an invisible layer of interactions (Fig. 4). The old Iron Man, of hand-drawn characters, invited our imagination to do the work. The new Iron Man exceeds the average imagination, and at times is ahead of the technological learning curve. The movie suggests a very large 3D interface, actually a generalized space of interactions. It has, as we can recognize, a holographic prototype interface, with direct manipulation of representations and functions (illustrated are the classical add and subtract functions of CAD systems). 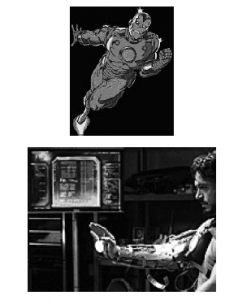 The protagonist, Tony Stark—Is he an AI engineer or something we cannot even qualify within current ontologies?—can stick his arm into the holographic representation and test the prototype. This is, of course, suggestive of a possible path in virtual rapid prototyping. Obviously, the language of interaction in Iron Man exceeds everything we can perform today. By all estimates, natural language based interactions will require processing performance associated with teraflops (IBM’s Big Blue worked in the range of over 500 teraflops), and memory in the range of peta- or even exabytes (with the associated management tools endowed with learning). This is still science fiction, but it should not prevent us from conceiving information processing learning environments at the human being’s performance level. However, a simple implementation, such as Microsoft’s Sync System, integrates Bluetooth phone and MPS players, allowing for commands as someone drives his car. This is indicative of possibilities, of course, not of what applications of real-time interactions actually require. But most important, in view of the anticipation-driven university, there is something else in the Iron Man example that should be brought up: Tony Stark works alone. He discovers as he goes. In the University of the Digital Society, learning, as I suggest here, involves many individuals, all interested in finding out how to endow a person with flight abilities (and many more). Therefore, imagine the system on which Stark works as available to all students, in their respective locations, working on virtual copies, refreshed as the learning process advances, and keeping track of new features. This again brings up the need to understand the human condition of those involved in the learning experience and the networking challenges. Bandwidth requirements and fast networking specifications, including the new kinds of switches to be involved, can be defined only after we understand the human aspects. Independent of the technology (holographic representations, gestural interfaces, speech recognition, interactive prototyping, etc. ), but definitely affecting the way we conceive the learning process, we have to address the complexity of the individuals involved in cooperative experiences. But let us further explore the computational challenge of such an anticipation-driven university. Multi-sensory experiences within immersive simulation leverage a variety of interactions. These are mediated through sensory devices, scalable wide-area simulation, hybrid stage design that integrates real elements (e.g., furniture, smart sensors, sense of depth, stereoscopic displays on natural scenes). Virtual components (2D objects represented on monitors, can be subject to actions similar to those performed on real objects. A learning experience evocative of that of the Wright brothers—conducting flight tests on the dunes of Kitty Hawk—can be extended to a virtual project dedicated to conceiving new flying forms. Moreover, instruments of choice in various laboratories could be fully embodied in anticipatory animation, i.e., generation of animations driven by real-life data modulated by possibility choices. Obviously, important challenges, such as those related to the notion of presence—are we in our room or in the game?—need to be properly addressed. For all practical purposes, current virtual reality delivers 3D through a left and right eye image, generated in a graphics pipeline updated in real time. The person sees renderings performed on database-stored information: lighting models, perspective projections of 3D onto a 2D display, color tables, tables associating head coordinates—position and orientation, i.e., 6 parameters—and real-time data from the tracking system. The objects displayed are associated with behaviors that then translate into acceptable or aberrant interactions. For someone immersed in the virtual environment, to interact with virtual objects means to coordinate the tracking of the head position and orientation with that of hands or legs. The entire process is relatively resource hungry. A 3D pointing device with selection options embodied in a 6-degreesof-freedom tracker help in the process but is far from being an intuitive interface. However, navigating such virtual spaces is a very engaging experience. The anticipation-driven university will, for instance, transcend the current VR systems for training surgeons only when the acquired knowledge (skills and understanding) can be effectively translated from its virtual condition to the reality of surgery (including remote surgery). Presence under these requirements is essential to performance. That presence is enhanced by sensory information (sound, tactility, motoric involvement) today seems undisputed. But we also know emotional aspects play an important role in presence—anxieties, for instance. Facial expression helps the surgeon who has a patient under direct observation. Skin color, muscle tone, joint mobility, and a number of physiological responses (i.e., reactions) modulate anticipations. But they can also cause distractions. In view of such considerations, provided here as mere illustrations of the complexity of the learning task, it is obvious that more fundamental research needs to be carried out as we continue to deploy components of the sui generis university of the future. Active learning (the Durham approach), not unlike age-based modeling, is a step in the right direction. In this respect, we need to focus on understanding how to transcend the model of image representation of reality, implicit in the science of computer graphics, in favor of making up new worlds. Such new worlds would correspond to our interrogation of what lies behind what we perceive. With the ever-broader interest in how the living unfolds, and in the dynamics associated with it, we realize the need to transcend reductionism—that is, the focus on parts and components—in favor of an integrated, holistic view of reality. Education must transcend its historic condition of segmentation of knowledge in favor of new forms of synthesis. Such new forms will include the creation of new materials, interaction methods, cooperation, and resource sharing. It has to be a manyto- many experience that allows everyone involved to question, to doubt, to ascertain, and to hypothesize. These are all forms of self-discovery and of the discovery of the world. Dynamic representations, in the form of animations, will replace current interfaces in order to better facilitate our handling of dynamic processes. On the one hand, we will continue to develop, at a new level, the analytic tools that inform our attempts to discover. We need them in order to precisely, but expressively, specify the elements we work with. 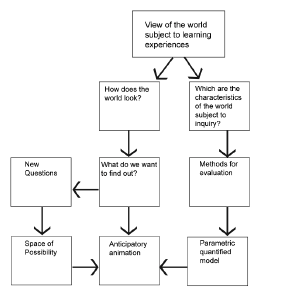 On the other hand, this descriptive knowledge feeds into anticipatory animations— explorations of what lies ahead, guided by all the knowledge we can enlist in the process. In fact, our anticipatory animation system consists of two parallel paths. The computer science associated with such a method for enhancing our access to real-time behaviors of complex systems is still very rudimentary. Recently, scientists became involved in a preliminary step towards anticipatory animation: reactive animation (cf. Efroni, et al. ). They separate animation from reactive behavior and entirely omit anticipatory processes [9, p. 46]. However, they correctly suggest that new forms of interactive games, with embedded learning and adaptive capabilities, might open new avenues for understanding the interaction between human beings and complex systems. Game characters, with underlying knowledge embodied in their individual behavior, might be useful representations for those trying to learn how to cope with the unknown, the different, the threatening, or how to be more successful in our actions (e.g., in war situations, extreme events, surgery, ecological challenges). Anticipatory animation is a cross-cultural form of communication. Obviously, those still captive to a rudimentary understanding of culture and to learning as only an achievement subject to testing will continue to avoid the more promising path sketched in this text. The anticipation of the University of the Digital Society is by many orders of magnitude less challenging than its realization. The community of computer scientists, educators, and innovators will have to learn how to work together to bring about this new University. Nadin, M., The Civilization of Illiteracy. Dresden: Dresden University Press, 1998. Nadin, M., Anticipation and Risk, at the Behavioral Analysis and RAHS Seminar, Singapore, July 2007. Nadin, M., “Anticipation and risk – From the inverse problem to reverse computation”, Risk and Decision Analysis, Amsterdam: IOS Press, in print. Macilwain, C., “U.S. Higher Education: The Arizona Experiment”, Nature 446, 2007, pp. 968-970. Lenzer, R. and S.S. Johnson, “Seeing things as they really are”, Forbes, 159(5), March 10, 1997, pp. 122-129. Nadin, M., Minds as Configurations: Intelligence is Process, Graduate Lecture Series, Ohio State University, Columbus, January 29, 1988. This lecture was published under the title Mind—Anticipation and Chaos. Stuttgart/Zurich: Belser Presse (Milestones in Thought and Discovery), 1991. “Smart desks make sci-fi a reality in the classroom”, ACM TechNews, September 22, 2008. “From Xbox to T-Cells: Michigan Tech Researchers Borrow Video Game Technology to Model Human Biology”, MichiganTech News, 2008. Efroni, S., D. Harel, I.R. Cohen, “Reactive Animation: Realistic Modeling of Complex Dynamic Systems, Computer, January 2005, pp. 38-47, 2005. Noam, E.N., “Electronics and the dim future of the university”, Science, Vol. 270, 1995, pp. 247-249. Sanchez-Vives, M.B. and M. Slater, “From presence to consciousness through virtual reality”, Nature/Neuroscience, Vol. 6, 2005, pp. 332-339.